Google changes Title Tag length. Do I need to trim? 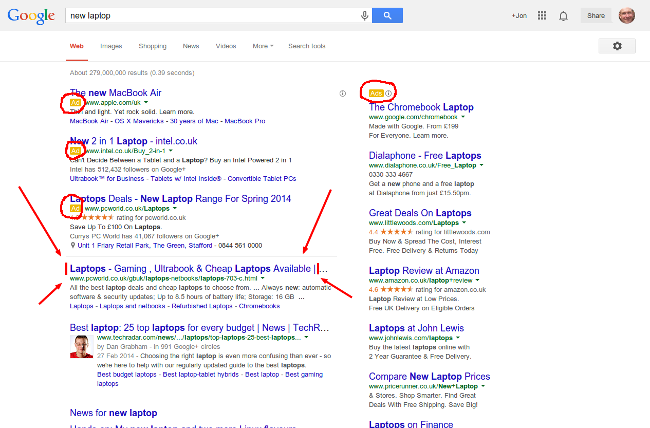 Its all change for the title tag as Google rolls out the new design of their search results page. The advice has always been to have have a title tag length of around 65 characters (inc spaces) but with the new design this is now going to be around the 55 character mark. As you can see from the screen shot above the font size has been increased and a little ‘AD’ icon is now making the adverts a little more obvious. Now that the font size is bigger the amount of characters available on a line has been reduced and for the title it sits around the 55 mark including spaces. One important thing to mention is that this change DOES NOT make any difference to where you rank but it may affect your click through rate and traffic. Do I need to change all my titles now? No. I’d change them slowly and gradually. I tend to think that if it ain’t broke don’t fix it but to be honest you’re going to have to start trimming title tags down very carefully. If you have a page that’s doing really well then don’t touch it but watch Google Webmaster Tools to see if you’re click through’s (CTR) go down at all. If it goes down it may be that your title tag is getting truncated and is not displaying how you want. If you have a page that’s not really doing wonderfully well in the search listings then it probably won’t hurt to change the title length straight away. When you add new pages to your site keep the title length at around 55 characters and you’ll be good to go. Does it matter if I’m over or under the 55 characters? My advice is always try to get it as close to the recommended length as possible but it doesn’t have to be exact. If you go over the 55 characters there is a chance that Google will truncate your title and a word might not be shown fully on the page, if this is one of your main call to action words or part of a main key phrase then it may reduce the clicks you get. Try and get a close to 55 as you can. Fire up your thoughts in the comments below. If you have time check out my other post on writing better title tags.